One of the largest and most impressive maps of England to appear in the 19th century. 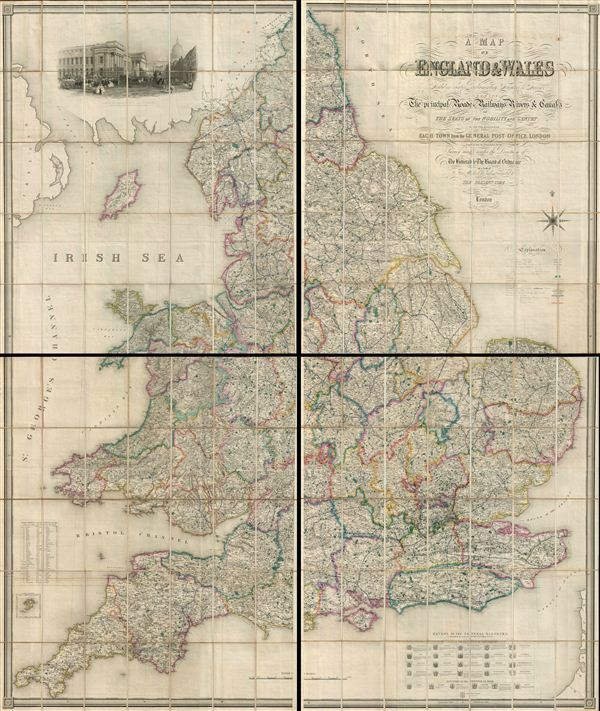 A Map of England and Wales, divided into counties, parliamentary divisions and dioceses : shewing the principal roads, railways, rivers and canals, and the seats of the nobility and gentry with the distance of each town from the General Post Office, London. A striking and monumental 1846 map of England by Samuel Lewis. Lewis issued this map to accompany his Topographical Dictionary of England, first published in 1831. In four large sections, this map covers all of England as well as parts of adjacent Scotland. As one might imagine form a map of this magnitude, it exhibits mind-boggling detail throughout, identifying topography by hachure, abbeys, towns, villages, gentlemanly estates, rivers, and of course, major cities. In the upper left quadrant of the map there is a beautiful view, drawn by T. Allom, of the London General Post Office. The lower right quadrant offers a list of Church of England Dioceses in Canterbury and York. This map was drawn by R. Creighton and engraved by John Dower. Samuel Lewis and Company, then based at 13 Finsbury Place, South London, is the publisher. The first edition of this map appeared in 1831 and subsequently editions followed in the 1840s, 1850s and 1860s. Editions vary primarily in format with few if any cartographic changes. Samuel Lewis (June 2, 1782 – February 28, 1865) was a British editor and publisher active in London, England, during the first half of the 19th century. Nothing of significance is known of Lewis's early life; however, he was most likely of humble birth and had little formal education. He was successfully involved in an important lawsuit against another English map publisher, Archibald Fullerton, which laid a significant precedent for future copyright cases. Lewis is best known for his topographical dictionaries of the British Isles; however he also produced numerous other maps including wall maps, case maps, and general atlases. Samuel Lewis and Company had several offices in and around London: 13 Coleman Street (1829 - 1830), 87 Aldersgate Street (1831-1840), 87 Hatton Garden (1842), 13 Finsbury Place (1846), and 19 Compton Terrace, Islington (1851-1865). Samuel Lewis of London should not be confused with another more important cartographer of the same name based in the United States. Very good. Map is dissected and mounted on linen. There are four sections, each of which fold into a gold stamped leather binder. Individual maps cleanly detached from binder. Includes linen slipcase for all four binders. Measurement provided includes all four panels, as photographed.